John Musgrave was a quarrelsome Parliamentarian who wrote a series of pamphlets pursuing a range of grievances. 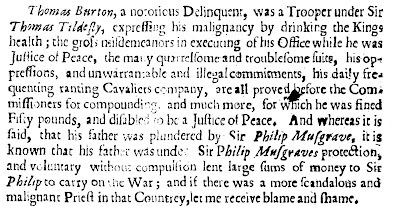 Thomas Burton, a notorious Delinquent, was a Trooper under Sir Thomas Tildesly, expressing his malignancy by drinking the Kings health; the gross misdemeanors in executing of his Office while he was Justice of Peace, the many quarrelsome and troublesome suits, his oppressions, and unwarrantable and illegal commitments, his daily frequenting ranting Cavaliers company, are all proved before the Commissioners for compounding, and much more, for which be was fined Fifty pounds, and disabled to be a Justice of Peace. 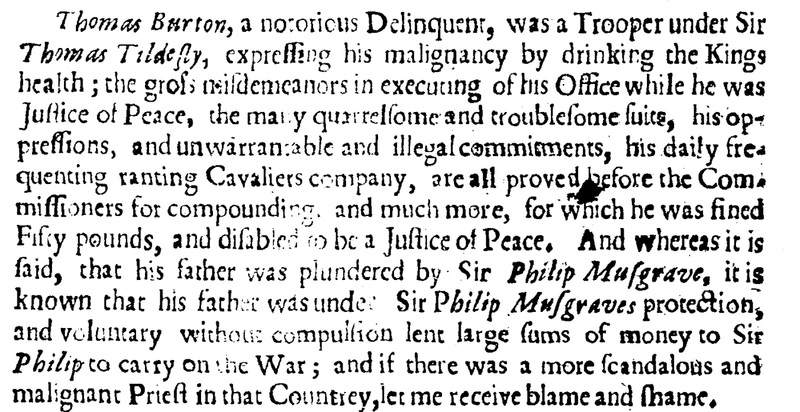 And whereas it is said, that his father was plundered by Sir Philip Musgrave, it is known that his father was under Sir Philip Musgraves protection, and voluntary without compulsion lent large sums of money to Sir Philip to carry on the War; and if there was a more scandalous and malignant Priest in that Countrey, let me receive blame and shame.